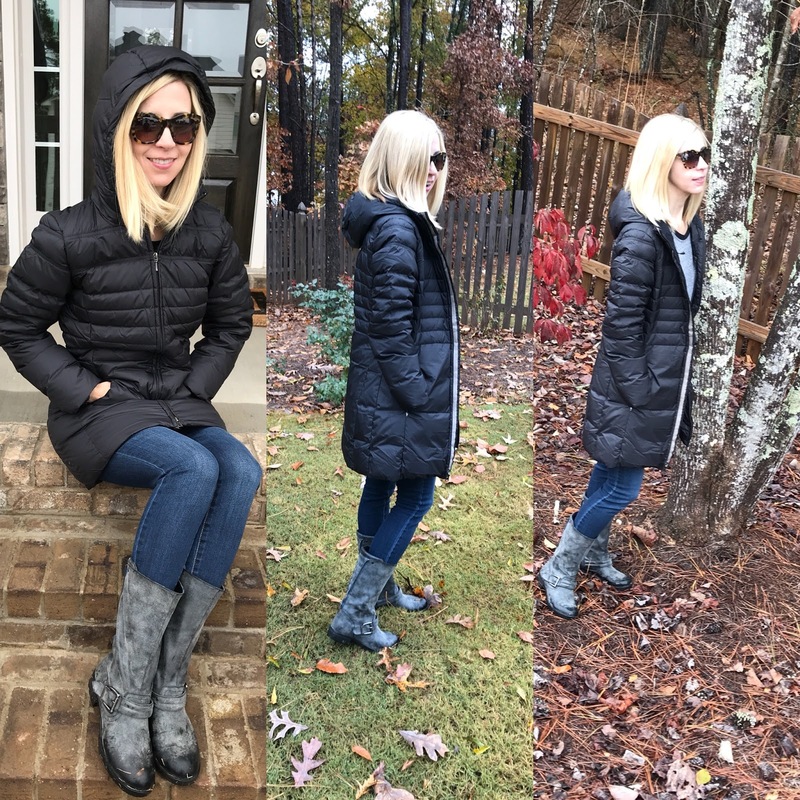 Pammy Blogs Beauty: Eco-Friendly Sustainable Winter Clothing from prAna: Plus Discount Code! 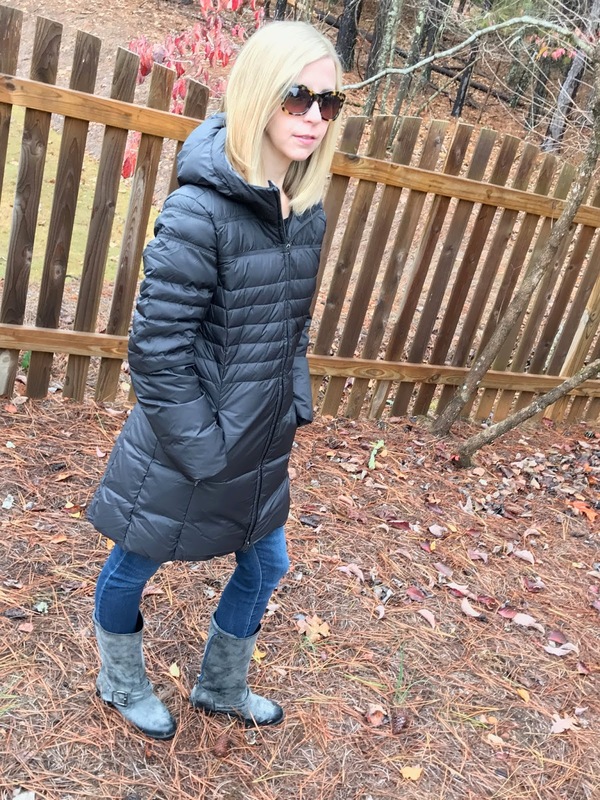 Eco-Friendly Sustainable Winter Clothing from prAna: Plus Discount Code! Clothing gifted in exchange for post. The cold weather has offically arrived here in GA. This time of year I always go through a major clothing re-organization. I replace old/worn items, look for holes or gaps in my wardrobe for needed items, and I look for 1-2 more trendy items to update my overall look. After sorting through my clothes, I have discovered that I have quite a few clothing needs. My clothing needs are frequently changing. Since going back to work part-time this year as a Speech-Language Pathologist, I find that I am frequently on-the-go seeing patients at various locations. I need clothing that looks casual yet professional while also being durable enough for a lot of movement during my active therapy sessions. So, I am really looking for items to add to a causal work wardrobe. Plus, I am in need of a super warm coat with a hood for cold and wet days when I am lugging around big bags of materials and can't carry an umbrella. So, when prAna reached out asking if I would like to collaborate, I was super excited to pick out some items from their extensive website. prAna is challenging us to go from farm to factory to our closets with the choice to purchase sustainable Earth-friendly clothing. Ask yourself the hard questions about the clothing that you choose and if it aligns with your thoughts towards our world. This is what I am starting to do and it really makes a difference. Sure, allow yourself some inexpensive trendy items every once in awhile. However, if you are building on items that you will hopefully love and enjoy for years to come, try to make choices that you will personally feel good about. I know that my choices from prAna are ones that I feel very, very happy about. Not only are the clothes great quality and beautiful, but also they are sustainable!!! So, lets get back to my clothing needs. My current focus is to build my wardrobe with quality pieces that I will love for years to come. I want items that wash well and feel good. I feel like prAna's quality is right up there with my standards! Plus, I just love that prAna is a sustainable brand that uses organic cotton and recycled fabrics. You can feel good when you are shopping at prAna because you know that you are purchasing Earth-friendly clothes! 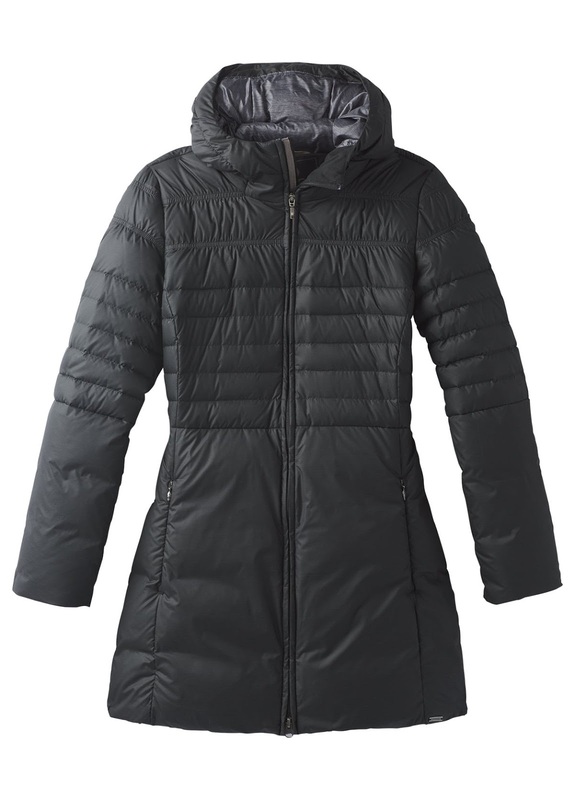 I picked out this gorgeous Miska Long Jacket because I was seriously in need of a very warm everyday coat. I really wanted something with these three features: waterproof, long/tunic lenght, with a hood. The Miska jacket fits all my criteria! I often find myself in the rain lugging around therapy materials, groceries, or kids! So, a hood is a must since I often have my hands full and can't carry an umbrella. Plus, I wear a lot of tunic tops with leggings. So, I like a coat that can completely cover my top. This Miska Jacket is soft and warm. The fit is great! I would say, if anything, that it runs a bit big. The XS is kinda big on me. However, I do realize that I am very tiny. It has great pocket storage and a ton of other details. This is a gorgeous and soft jacket with amazing quality that I will enjoy for years to come! Seriously, it is a beautiful jacket and I just love it!!! It honestly goes with everything and it keeps me totally warm and dry. This jacket retails for $199 which I think is a great price considering the tremendous quality, beautiful design, and sustainability. The other item I was sent was the Kayla Jean in the shade Volcanic Plum. This wasn't my first choice from the site as they were out of stock in some of the other pants that I liked. However, the Kayla Jean turned out to be a fantastic choice for me! Colored jeans are great for my lifestyle right now as they have the durablity and wear of a jean. However, the shade makes it less "jeans" looking which works great for me for work or when I want to look like I am dressed up just a "tad" more than the regular jeans look. Another surprise was the fit of the Kayla Jeans. I am tiny and very in size depending on brands. I seem to almost always fall somewhere in the 0-2 size. However, in the Kayla Jean, I wear a size 00. The fit is snug on me, but the size 00 does work. I think a 0 might be perfect for me, but the 00 does work. I got a regular length and do think that I could have ordered the short as I do have short legs. So, these do run about a size or two big. So, keep that in mind when you order. The prAna site does have a size converter tool which is helpful. So, I suggest knowing your measurements when ordering. The fit is super slim and the rise on the waist is excellent. There is extra seaming at the waistband to prevent that "gap" that sometimes happens with jeans. The fabric is nicer than a regular denim and it does have a bit of stretch to it. The shade volcanic plum is real life looks more like a soft plum-ish brown to me. 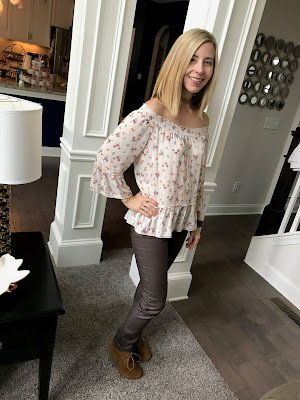 It is actually a quite versatile color and I am having fun pairing it up with various tops in my wardrobe. 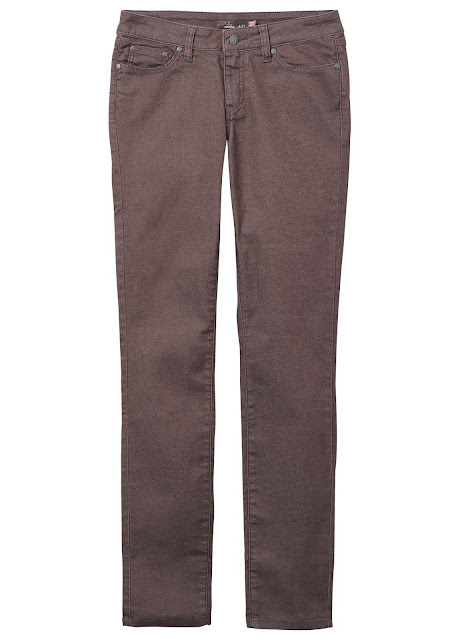 The Kayla Jeans retail for $89.00 which is right on target with what I usually pay for a good fitting pair of jeans. These are so flattering and the fit is so good that I seriously want more colors of this same style!!! Get 15% off your order at prAna!!! Here is a discount code so that you can get 15% off prAna when you shop online.